Maintaining a fairly active del.icio.us account, I often tag pages by course number (106, 419, 505) in addition to by subject matter. 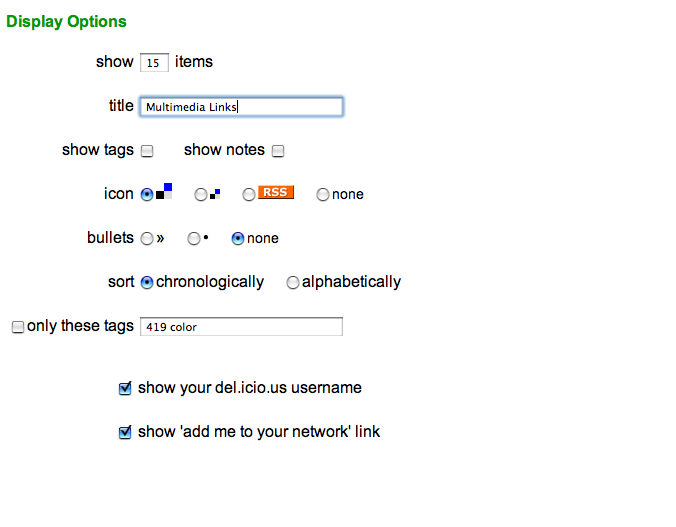 I first came to love del.icio.us when I realized how easy it made it for me to share links with my students. This brings us to pedagogical possibility #1: using del.icio.us to create customizable, adjustable, week-by-week reading lists. The image to the right displays the link roll generator. Besides some straightforward display options, you'll notice the "only these tags" check box and form field. Simply specify the tags you want to display, wait for the preview to finish loading, and Presto! Simply replace the highlighted tags above with whatever you want displayed that week and you have a customizable reading list. Those who are interested in standards-compliance can delete the <noscript> elements. Up next: Pedagogical Possibility #2.